Congress sources said Alpesh had been smarting after the party denied him a ticket to contest the Patan Lok Sabha seat. Congress’ maverick Gujarat legislator Alpesh Thakore, who had been keeping the party on tenterhooks for some time, resigned on Wednesday, over his “side-lining” by state leaders in several key issues. Thakore was due to address a press meet soon to formally announce his decision. The development came hours after the core committee of the Gujarat Kshatriya Thakore Sena, which he had himself floated several years ago, late on Thursday night, decided to sever all ties with the Congress and exhorted Thakore to resign from the party. “During our meeting, we decided that the Thakore Sena would have no ties with the Congress. We did not consult Alpesh Thakore but we have conveyed to him to make up his mind within 24 hours,” Jagat Thakore, member of the Thakore Sena, told reporters. “We have made it clear that if he wishes to be with the Congress, he must leave the Thakore Sena and if he remains with the Thakore Sena, he should sever ties with the Congress and resign as an MLA,” he added. According to Jagat Thakore, the Congress has been side-lining the Thakore Sena in selection of candidates for the Lok Sabha elections as well as in taking important decisions. Congress sources said Alpesh had been smarting after the party denied him a ticket to contest the Patan Lok Sabha seat, which he claimed he could easily win, and chose veteran party hand and former MP Jagdish Thakore. The party also ignored the Thakore Sena’s demand for ticket to contest the Sabarkantha and Banaskantha seats. Thakore Sena’s Swarupji Thakore has already filed his nominations in Banaskantha, while another member Natwarji Thakore is contesting the by-election to Unjha assembly constituency, as Independent candidates. 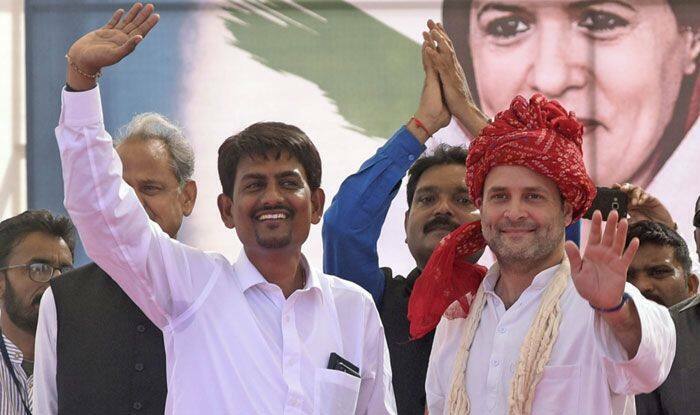 A prominent OBC leader, Alpesh Thakore had joined the Congress ahead of the 2017 assembly elections and won from the Radhanpur seat on a party ticket. He recently met Congress President Rahul Gandhi and conveyed his displeasure against the functioning of the party’s state leadership. The OBC leader had claimed his community and supporters were feeling “cheated” and “ignored” but later claimed his issues were sorted out.